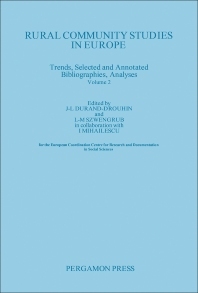 Rural Community Studies in Europe: Trends, Selected and Annotated Bibliographies, Analyses, Volume 2 documents studies concerning several rural areas in Europe. The book presents information concerning a specific area, which includes a review of historical trends; annotated bibliography; and an analysis of studies conducted on the area. This volume particularly covers rural areas in the Netherlands, Germany, Hungary, Italy, and Finland. This book will be of great interest to researchers who require information about rural communities.